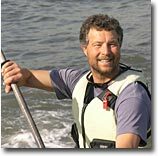 Roger is co-author of Sea Kayak Rescue, the Definitive Guide to Modern Reentry and Recovery Techniques. He’s an American Canoe Association Instructor Trainer Educator, the ACA’s highest level of certification. He owns Eskape Sea Kayaking, an outfitter and guide service in Santa Cruz, California and has also written Guide to Sea Kayaking Central and Northern California, winner of a National Outdoor Book Award. He and his wife Lisa had been exploring a remote and cliffy stretch of the California coast near Big Sur. To avoid a shallow, reefy area of surf around one of the headlands, they’d headed further out to sea into deeper, albeit choppier water off the point. 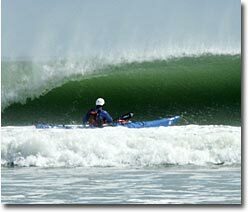 “That’s when it hit me.” A wave from the following seas broke across his stern causing his kayak to broach sideways. “Next thing I knew, I was counting fish.” After missing two roll attempts, he bailed out. At first, he said, he wasn’t sure what to do next. In several years of paddling, he’d never actually had to do a rescue in a real-life situation. After inflating his float and starting to scramble up onto his back deck, he looked over to see if Lisa was safe. Fearing the worst, he discovered that not only was Lisa doing fine, “Damned if she was several steps ahead of me, just beginning to corkscrew herself back into her seat.” He also noticed that although they were still several hundred yards out to sea, the wind, as forecast, was sweeping them toward calmer water in the lee of the point instead of further out to sea. By the time they’d finished pumping their boats dry and stowed their paddle floats, they found that both the seas and their emotions had calmed enough for them to continue on their way. Although his story began like a typical accident report, it had a happy ending. But not because they got lucky. They made their own luck. No one read about their misadventure in a kayak magazine because they had taken the time to arm themselves before the trip with not only the skills necessary, but also the gear and knowledge to turn a potential disaster into nothing more than a routine dunking. Many kayakers nowadays prefer to think of them as “capsize recoveries” or “reentries” instead of the older, more loaded term “rescues.” This mindset tends to look at an occasional capsize as just part of the sport, like falling down skiing. With regular practice, reentries begin to become second nature and no big deal. But practicing in a pool or a lake alone is not enough. Some rough-water practice, following the adage, “Don’t paddle in water that’s rougher than you’ve practiced recoveries in,” helps you to stay within the limits of your abilities and develop the skills it takes to get back in your kayak quickly in the kind of real-life seas you’re more likely to capsize in the first place. Not only had Robert and Lisa practiced recoveries in rough water, they were also dressed for the possibility of ending up in the water, wearing wetsuits and paddle jackets in the 54-degree water. Statistically, hypothermia from cold-water immersion kills more sea kayakers than all other reasons combined. So dressing in a way that allows you to fall in the water, reenter your kayak and continue on your way without becoming hypothermic also helps keep a capsize from becoming a catastrophe. In addition to a paddle float and a bilge pump to remove the excess water from their kayaks, both Robert and Lisa paddled touring kayaks with hatches front and back, providing plenty of flotation to reenter their boats even in rough seas. They also carried a spare paddle, in case one got lost or broken, as well as safety flares and a dry bag with a spare set of warm, dry, non-cotton clothing. Depending on your trip, marine radios, charts, compasses and the like, may also be appropriate. Checking a weather forecast before you leave home can help you to avoid unsafe conditions and use the wind to your advantage. For example, a common trick for day trips is to head into the wind in the morning so you can let it blow you home, instead of beating into it, in the afternoon. Knowledge of the day’s tides, can also be used to help you “ride the tide” in some places or avoid both contrary currents or becoming stuck on a mudflat during a falling tide. 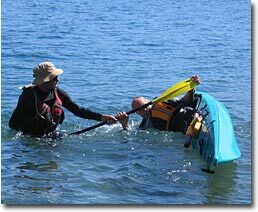 As goofy as it sounds, the old cliché “safety is no accident” definitely applies to sea kayakers, as does the phrase, “the sea has little mercy for fools.” Some solid pre-trip preparation can help keep you from finding yourself at the mercy of the sea and can make even an unexpected capsize just part of the routine.